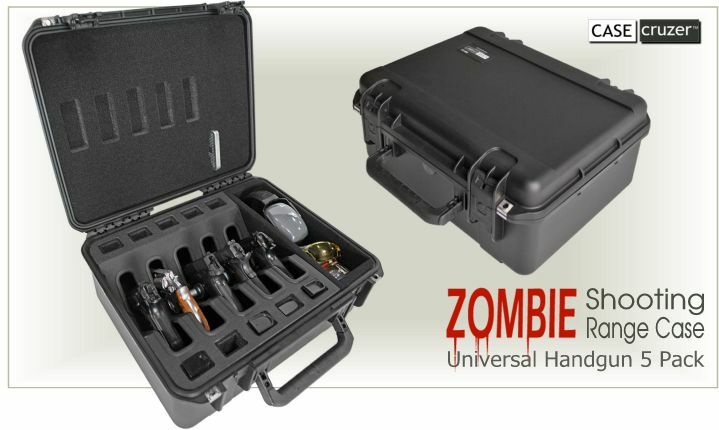 The CaseCruzer Zombie Shooting Range Universal 5 Pack Handgun Case makes it easy for preppers and other pistol owners to keep the upper hand when flesh-eating monsters invade. Simply trigger the security latches, open the rugged range case and behold the five pristine guns that await you in quick-draw position. Or bug out and make a run for it with the new CaseCruzer pistol range case that is ideal for traveling. Firearms are protected by a sturdy hard-shell, plastic copolymer exterior and a padded interior. The exclusive interior rack system of this reusable transport solution promises that no damage, not even a scratch, will ever mar weaponry. A lifetime warranty protects against unforeseen bumps and Zombie smackdowns. Nothing will crack this case. “Sportsmen and handgun enthusiasts probably will never face an alien invasion. But that doesn’t mean our new case isn’t designed for every situation. Mostly, we want to provide professional marksmen and weekend sportsmen with an economical but rugged, dependable and secure handgun range case that protects against theft and extreme weather. We’ve got you covered,” says Tatiana Briceno, CaseCruzer marketing director. The exterior dimensions are a compact 20.25”L x 16.93”W x 8.78”H. And when empty, the pistol pack weighs only 11.20 lbs — another reason the pistol range case is so handy for battles with the alien contagion, or shooting range practice and competitions.